Beautifully engraved certificate from Comcast Corporation This historic document was printed by the American Banknote Company and has an ornate border around it with a vignette of Revlon's products between two allegorical women. This item has the printed signatures of the Company’s President ( Brian L. Roberts ). This certificate is a very low number. 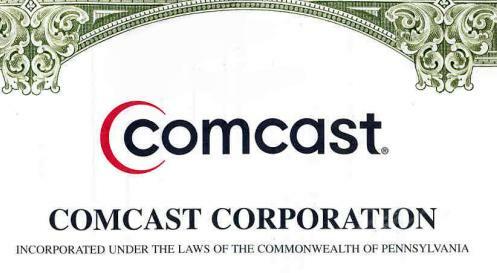 Comcast Corporation is principally involved in the development, management and operation of broadband cable networks, and in the provision of electronic commerce and programming content. Comcast Cable is the largest cable company in the United States serving more than 21 million cable subscribers. Comcast's commerce and content businesses include majority ownership of QVC, Comcast-Spectacor, Comcast SportsNet, The Golf Channel, Outdoor Life Network, G4, a controlling interest in E! Entertainment Television and Style, and other programming investments. PHILADELPHIA, PA -- Comcast Corporation (NASDAQ: CMCSA; CMCSK) today announced that its transaction with AT&T Broadband is complete, bringing together cable assets serving more than 21.4 million subscribers in 41 states. The new Comcast Corporation, formerly named AT&T Comcast Corporation, provides digital cable to 6.3 million customers, high-speed data to more than 3.3 million customers and cable phone service to more than 1.3 million customers. Brian L. Roberts, Chief Executive Officer of Comcast, said, “This is an historic moment for the entire Comcast family – including our employees, customers and shareholders. This vibrant new company is a leader in serving consumers with exciting new products and technologies, and is focused on providing the highest standards in customer service. “Comcast is a financially strong company uniquely positioned to generate significant benefits for our customers and shareholders alike. Our focus now turns to bringing all of our cable systems up to the Comcast standard, quickly moving to deploy digital cable and data to meet the growing demand for these products, and continuing to deliver consistently strong financial results. I’m excited for the many opportunities that lie ahead of us,” said Mr. Roberts. C. Michael Armstrong, Chairman of Comcast, said, “Today marks the birth of a leading national broadband communications media and entertainment company. The people of Comcast and AT&T Broadband should be proud of what they have created, and excited for the opportunities that the future is sure to bring. I’m looking forward to working closely with Brian and the management team to help realize the potential of this great new company.” Under the terms of the previously announced transaction, AT&T has spun off AT&T Broadband and combined it with Comcast. As a result, AT&T shareholders are entitled to receive 0.3235 shares of the new Comcast Corporation Class A common stock in respect of each share of AT&T common stock they owned at the close of business on Friday, November 15, 2002, the record date for the spin-off, and will continue to hold their shares of AT&T common stock. 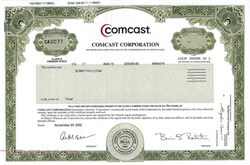 Comcast shareholders will receive for each share of old Comcast common stock one share of the corresponding class of the new Comcast common stock. The new Comcast common stock will begin trading under the NASDAQ symbols CMCSA and CMCSK on Tuesday, November 19th. The Comcast Board of Directors consists of 12 directors. The five directors appointed by Comcast from its board are: Decker Anstrom, Sheldon M. Bonovitz, Julian A. Brodsky, Brian L. Roberts and Ralph J. Roberts. The five directors appointed by AT&T from its board are: C. Michael Armstrong, J. Michael Cook, George M.C. Fisher, Louis A. Simpson and Michael I. Sovern. The jointly appointed board members are: Kenneth J. Bacon and Dr. Judith Rodin. About Comcast Comcast Corporation (www.comcast.com), formerly known as AT&T Comcast Corporation, is principally involved in the development, management and operation of broadband cable networks, and in the provision of electronic commerce and programming content. The company is the largest cable company in the United States serving approximately 21.4 million cable subscribers. The Company’s commerce and content businesses include majority ownership of QVC, Comcast Spectacor, Comcast SportsNet, E! Entertainment Television, Style, The Golf Channel, Outdoor Life Network and G4. Comcast Class A common stock and Class A Special common stock will be traded on The NASDAQ Stock Market under the symbols CMCSA and CMCSK, respectively.